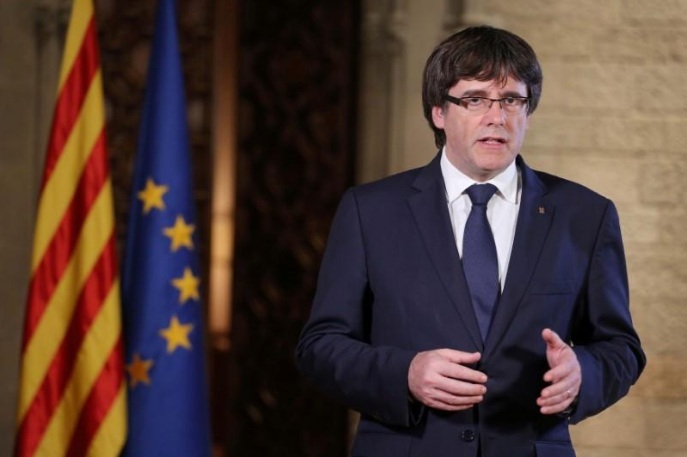 Catalan President Carles Puigdemont gives a speech at the Palau de la Generalitat, the regional government headquarters in Barcelona, Spain, October 21, 2017. MADRID - The political crisis in Catalonia cannot by solved simply by calling regional elections, the Spanish Justice Minister said during a radio interview on Tuesday. “Everything is not fixed just by calling an election,” Rafael Catala said. Catala said if the regional leader of Catalonia Carles Puigdemont appeared before the Spanish upper house of parliament, the Senate, it would be a positive step in finding a solution to the conflict between the restive region and Madrid. The political crisis in Catalonia cannot by solved simply by calling regional elections, the Spanish Justice Minister said during a radio interview on Tuesday. “Everything is not fixed just by calling an election,” Rafael Catala said.